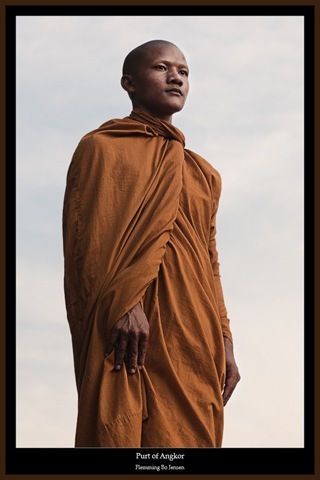 One of our two monk friends and models, Purt, was an inspiring, intelligent man with a great smile and quick wit. He learned English from working as a seller of all things to tourists at Angkor as a child. He was therefore also very street smart and cheeky, not letting on he knew English until he had sized me and my guide Nathan Horton up for a while. We drove around the massive city of Angkor in a tuk-tuk and I dearly wish someone had a snapshot of me, Nathan and two monks sitting in a tuk-tuk. I find that the sky itself can work great when you are looking for a clean background. Simply lower the camera and use the sky as your backdrop. In this image it also lends Purt a majestic sculptured look and the soft sunset light filtered through thin clouds is the perfect illuminator. It is a very posed image but I like both candid and posed portraits. Both styles can work. I have subtly added a little contrast to this, enhanced structure and edges and created the desaturated muddy look but the image was quite satisfying already as captured so it needed little work. PS. I am surely spelling his name “wrong” as in there really is no translation from the khmer language to English so it is basically spell it however you like! Purt definitely makes a good statue. Very regal and serene. Very proud indeed! Powerful theme to this image Flemming. Cheers Dave, I like it very much myself. Hi Adrian, that sounds great, I am positive you will come away with some great images and experiences on a trip with Nathan. 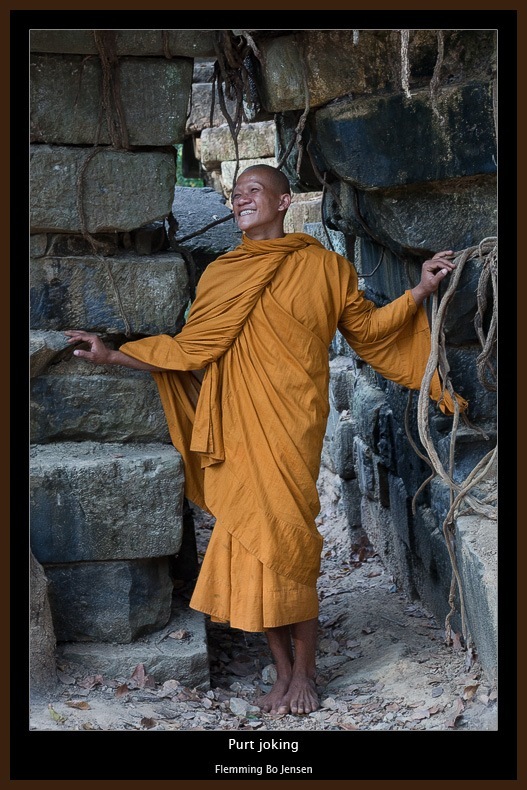 My Cambodia gallery should be up in a few weeks, will give you an idea of what we did. Great to see your connections across language and cultural "barriers" – who actually said they were barriers anyway. I'm looking forward to your Cambodia gallery. Yep, no barriers, I agree, language and cultural differences are one of life's and travels great pleasures and learning inspirations. It's one of the things I miss most about Europe and Copenhagen, the big melting pot of languages and cultures.